Several interesting glimpses into local history appeared in media over the past week. Reports on CBC and elsewhere described how the Art Gallery of Ontario has changed the name of one of Emily Carr’s paintings. The Art Gallery of Ontario has scrubbed the word “Indian” from the title of a painting by the late Canadian artist Emily Carr, because “that is a word that causes pain,” curator Georgiana Uhlyarik says. The 1929 painting originally known as Indian Church was re-hung in the Toronto museum in early May under the new name Church at Yuquot Village, a nod to the BC Indigenous community where the church was located. “We feel that we are moving something forward, rather than staying in one place and repeating . . . the hurt of that word,” Uhlyarik, the co-leader of the AGO’s department of Indigenous and Canadian art, told As It Happens host Carol Off. . . .
Uhlyarik said the AGO consulted the Nuu-chah-nulth First Nations, on whose territory the church was located, before making the change. “It was the very first phone call that we made,” she said. The church in the painting was built on member nation Mowachaht Muchalaht’s territory by Christian missionaries in 1889. Carr first saw it on a visit to the West Coast [of Vancouver Island] in 1928. The story, which provides Uhlyarik’s rationale and some negative response, can be found here.
. . . But for Ligwilda’xw interdisciplinary artist Sonny Assu of Campbell River, BC, changing the name of the painting does not spark a conversation about colonial history so much as it “revises” it. 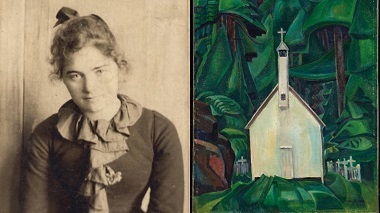 I wrote about Emily Carr’s Christian faith – and conflicted relationship with the church – here. 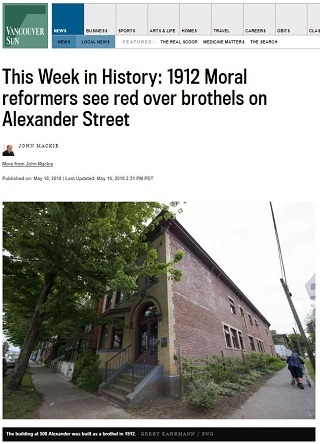 John Mackie wrote a really interesting article about ‘This Week in History,’ May 18: 1912 moral reformers see red over brothels on Alexander Street. At that time, Vancouver’s red light district was centred around Alexander Street, several blocks east of Main Street, near the waterfront in Japantown. In the 1913 Henderson’s directory, there were 27 female names listed in the 500 and 600 blocks, including Lily White and Pearl Gray. Some of the madams were so successful they built their own brothels. This did not sit well with reformers who had been trying to rid the city of vice. Among them was Minister Wright of the Kitsilano Presbyterian Church, who denounced the city’s laissez-faire attitude toward brothels from his pulpit on May 19, 1912. 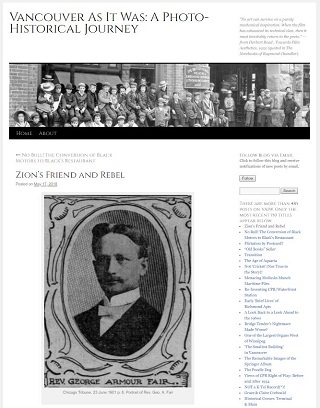 The Vancouver World reported his sermon on “The Problems of Our City” the next day. 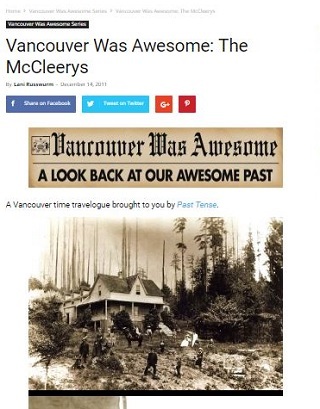 In April 1863, Fitzgerald and Samuel McCleery built the first house in what is now Vancouver. The *** top photo shows a larger farmhouse that replaced the original in 1872. With the opportunity to “pre-empt” land in Western Canada for $1 to $2 per acre, in April 1863, Irishmen Mr. Fitzgerald McCleery and Mr. Samuel McCleery became the first settlers in Vancouver when they constructed the first dwelling and operating farm on the river bank of the North Arm of the Fraser River. John Alexander Dowie’s divine healing movement had a connection with Vancouver’s Baptists, briefly, in the person of Rev. George Armour Fair, the pastor of Jackson Avenue Baptist Church (aka “Zion Baptist”) in 1898. Jackson Avenue was “The ‘East End’ mission church of First Baptist Church, Vancouver.” The story is a fairly complex one – and ranges far afield from Vancouver – but is worth the read.